Feeling a bit square in the jowl area ? Looking for a lift to define your jawline ? Then the CACI Jowl lift treatment may be just what you are looking for. What exactly is CACI ? CACI is a Non-Surgical treatment that is designed to exercise and rejuvenate muscle to define a more youthful and defined face shape. CACI uses a patented micro current that targets the optimal point of the muscle responsible for movement & shape. This way it can deliver results that are non-comparable to any other system with minimal sensation. Our CACI therapists are certified CACI trained. You can therefore be assured that they will be delivering guaranteed technique with optimum results. Celebrity fans include Jennifer Lopez & Jennifer Aniston (i.e. the Jen Effect) as well as Martine McCutchenson, Dale Winton. For nearly all of the CACI treatments, to achieve maximum results, a course of 10 to 12 treatments are highly recommended followed by regular maintenance every 4 to 6 weeks. Single treatments such as the “4 day Ultimate facial” are available for special occasions. What is a CACI Jowl Lift ? The CACI Jowl lift is a targeted treatment for the Jowl area. 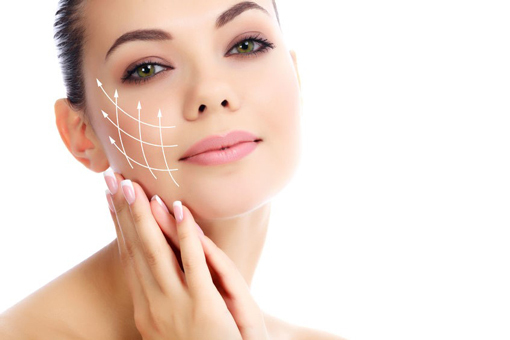 So if you are in need of a little lift to reduce the square effect of a sagging jowl area, rather than the youthful heart shape it once was, this could be just the treatment for you! The treatment uses 2 quad probes and a series of movements that uses an electrical signal to stimulate the muscle to lift and shape the lower face muscles. It’s rather like gym for the face. But very like gym for the face you wouldn’t expect results that last after 1 treatment and you certainly wouldn’t run a marathon the 1st time back to exercise. This is why a treatment plan of 10 to 12 treatments will give the best results. The treatment is perfect for both men & women and takes only 20 mins once the skin is cleansed so perfect for a lunch time treatment. A more defined jowl creating a more youthful profile. Can anyone have this treatment ? No, whilst the treatment is suitable for most clients unfortunately there are a few clients this is not a suitable treatment for or who may need 15 rather than 10 treatments. We therefore recommend a consultation in advance of booking a CACI treatment course to discuss your specific medical history and other options to combine with your treatment should you require an accelerated result. Want to know more about the CACI Jowl Lift ? Please contact a member of the Studio 8 Beauty team on 02392 380 692 to arrange a complimentary 30 mins CACI consultation & see what CACI can do for you. Pricing £30 (20 mins) for 1 treatment. A course package is available with FREE upgrades..